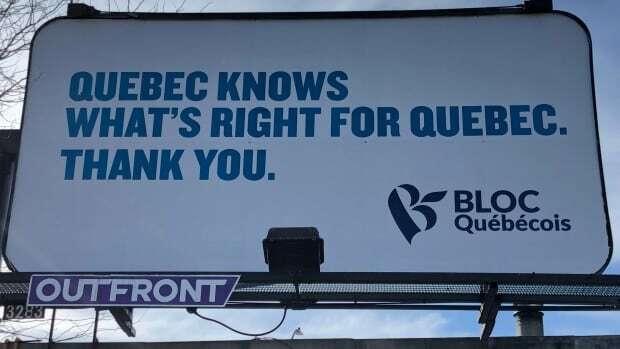 The Bloc Québécois is trying to get a message out about the Quebec government’s controversial secularism bill — and has hired a billboard in Ottawa to make the case. While it doesn’t have official party status in the House of Commons, the Bloc Québécois remains the only party represented in Ottawa that supports Quebec separatism. Bloc Leader Yves-François Blanchet said the sign refers to Quebec’s Bill 21, a law tabled last month by the provincial government of Quebec Premier François Legault that would ban some public employees from wearing religious symbols. Legault justified the bill in part by pointing to a poll that said 67 per cent of Quebecers supported the notion of a ban on religious symbols, such as hijabs and turbans, for public employees in positions of authority, including teachers, police officers and judges. “The only English version of this law that has been explained to the Canadian citizens has been explained by Prime Minister Justin Trudeau,” said Blanchet. NDP Leader Jagmeet Singh, who wears a turban himself, has come out against the bill, saying it’s a program for sowing division. “I think it’s hurtful, because I remember what it’s like to grow up and not feel like I belong,” Singh said soon after it was tabled. Blanchet said he fears the federal government will subsidize legal challenges of the bill. The proposed ban would apply to, among others, Quebec Crown prosecutors, judges and any public employee who carries a firearm, as well as teachers and principals. There is a ‘grandfather’ clause in the bill to exempt some public workers from the ban — including teachers — as they hold their current jobs. This new bill invokes the notwithstanding clause to work around any potential Charter of Rights challenges. That clause allows provincial or federal authorities to override certain sections of the charter for a period of five years. The Bloc Quebecois has struggled since the 2011 election, which saw its caucus diminish to just four seats. The party won ten seats in the last federal election — still not enough to secure official party status.